Box Dimensions (LxWxH) 18.4 x 12.5 x 12.4"
70-200mm T2.9 Compact Zoom CZ.2 Lens (PL Mount) is rated 5.0 out of 5 by 2. Rated 5 out of 5 by Kiliwa from Amazing Glass, great form factor Extremely lightweight and completely another type of beast if comparing with either Nikon or Canon plastic lenses. Interchangeable mount makes it a really cool lens for many situations. In PL version, you can also add a 2x Extender and get a 140-400mm with still a extremely good quality and very useful for wildlife as well as other appplications. Mount is very solid and weight helps to move quickly as well. Wether you want to shoot a film, a comercial, a concert or music video, having this lens will open you to a whole new world of possibilities due to its characteristics. The quality of this lens surpassed my expectations honestly but since it is not a rehoused still lens, but a whole new cinema lens design it makes sense. Many grumpy cinematographers would still say this is neither a DSLR lens nor a High End cinema lens, but I can tell you this lens is up to compete with bigger and more expensive lenses anytime for a much lower price, which still is not low but worth each penny. I'm interested in the PL version of this lens. Does the interchangeable lens mount option mean there is an EF mount to use with 5D? 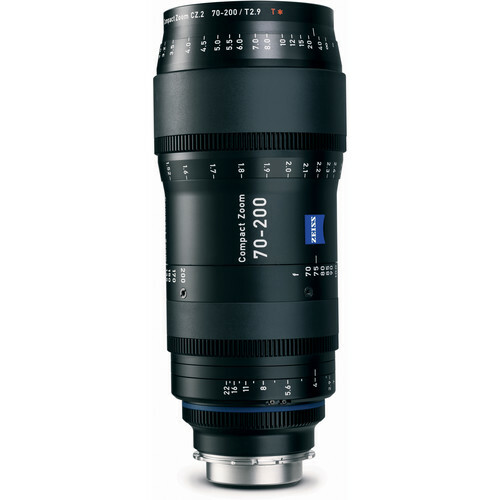 Zeiss has made the CZ.2 zoom lenses adaptable to other mounts. Zeiss lists these mounts as available. Please contact us so that we may order the mount for you.Available mounts. PL, EF, MFT, F, E.
The ZEISS CZ.2 cine zoom lenses are designed to be companions for all ZEISS cine primes including the ARRI/ZEISS Master Prime and Ultra Prime, in addition to the Compact Prime CP.2. The lenses are color matched to each other and will provide similar image performance in terms of contrast and resolution.